After getting off to a slow start I'm really enjoying this project and I've a good feeling about how it's progressing. It isn't very often that something turns out exactly how you wanted it to but so far so good. There is still a fair bit of painting to do on Gutrot and the base will need all due care, time and attention to pull off the look I want. But by making this my big project for the year, I should be able to do the job properly. 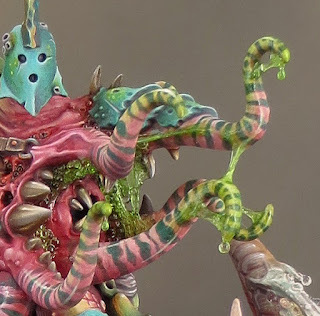 I've come to the realisation that there is no way I'll get a Putrid Blightkings unit painted in time for GD this year so I’ve rethought my painting schedule. I still want to do the unit but it will have to be a long term project. It's the Dark Eldar diorama all over again! On the positive side, with the deadline pressure off, I can really go to town with the nautical theme for the Blightkings. I’m going to tidy up Gutrot and finish off the upper body then he will go onto the back burner for a while. I have a (hopefully) smaller project in mind for Salute that will take over for a couple of months. After that, and once Gutrot is finished, I might see about doing something else for GD - but I'll see how it all goes. I didn’t get much painting done last week. I couldn’t quite drum up the energy and enthusiasm to settle down and get to it, so I shouldn’t have been surprised when I felt the first signs of a cold coming on last Friday. For the record that’s the third cold I’ve had since starting ‘project Nurgle’. It’s enough to make a person superstitious! At the weekend I decided not to tempt fate by forcing myself to paint. Gutrot Spume is going well but the paint job takes a lot of effort and concentration and I really didn’t feel up to it. I decided instead to tinker with some ideas for his base. That way I could get something constructive done without risking the mini. I’ve always been sure that I wanted Gutrot to be on a boat of some kind. His role as master of the plague fleet had inspired me to adopt a nautical theme and a boat just seemed like the most natural choice. But even the best idea in the world is no use if you can’t make it a reality. What I really wasn’t sure about were the details of size, composition and construction. That’s been worrying me quite a bit. I’ve gathered together a collection of reference pictures and spent a lot of time just thinking about what I wanted to do and about how to do it. I realised that the best solution was to simply stop worrying and start constructing. If things didn’t work out there would be no harm done, and some useful lessons might be learned. I began construction with cardboard and masking tape. The idea was to knock up something rough and ready that would help me sort out my ideas and figure out the practicalities. My first try at a card dummy of the boat worked out surprisingly well. With a spare Gutrot Spume to hand I was able to figure out both the size and composition very quickly. I think all the time I’d spent worrying had helped me develop my ideas to the point that all I really needed to do was to have the courage of my convictions. The card dummy was the correct size and shape but it lacked any sort of strength or stability. My initial plan had been to use this dummy as a template for the ‘proper’ construction. I decided to see if I could stabilize and strengthen the dummy with super glue and milliput. The super glue soaked into the card and set the construction rigid while the milliput filled the gaps to give me a solid core over which I could add the surface textures. Before I knew it my cardboard dummy had become the core for the final piece. At this point I’ll apologise for the lack of work in progress pictures. I had no idea when I started that my experiment would go so well and was simply enjoying a weekend spent tinkering with cardboard and glue. With a solid core constructed for my boat I turned my attention to the surface detail. I’ve always favoured balsa wood as on option but was unsure about the details of construction with this material. Now that I had a solid and stable core the balsa could simply be used as a surface veneer. Sunday was spent cutting strips and panels of balsa that I then carved and shaved to fit the core. A combination of PVA wood glue and super glue fixed the balsa in place. I’ve begun working on the surface with wire brushes to add some texture and damage to the wood and the boat is beginning to develop a bit of character. The biggest surprise is that the resulting boat is very close to my initial ideas! There is a lot of work that needs to be done to finish off the detail and add texture but my weekend of experimentation has proven to be far more productive than I ever could have imagined. 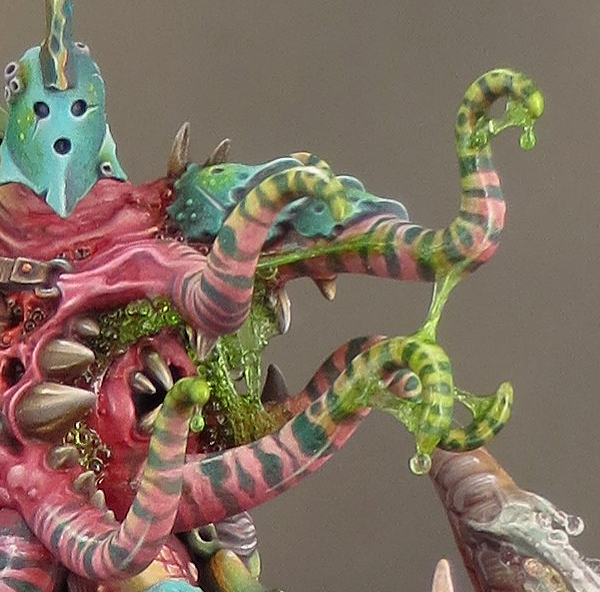 It looks like Papa Nurgle knew what he was up to when he gave me this cold! Having finished painting Gutrot Spume’s tentacles it was time to turn my attention to the next stage and apply some ‘special effects’ in the form of a layer of slime. I’ve also decided that I need to do a bit more with some areas of the paint job that I’d thought were finished. I’m happy with what I’ve done but Gutrot needs a bit more weathering and damage to take him up a level. There always seems to be more that needs to be done with this mini but I think the effort is paying off. To create the slime I used the same basic technique that I employed for the whip on my hellion and the tutorial can be found here. However a few years have passed since I first used this technique, and I’ve added some refinements that have enhanced the finished effect. UHU glue makes delicate stringy threads over which I built up the slime. I can achieve a strong transparent colour in contrast to the more opaque look achieved with paint by using Tamiya clear acrylic colours to tint the slime. I also now use invisible thread to support any drips that I build up. This is fine, transparent, nylon thread. 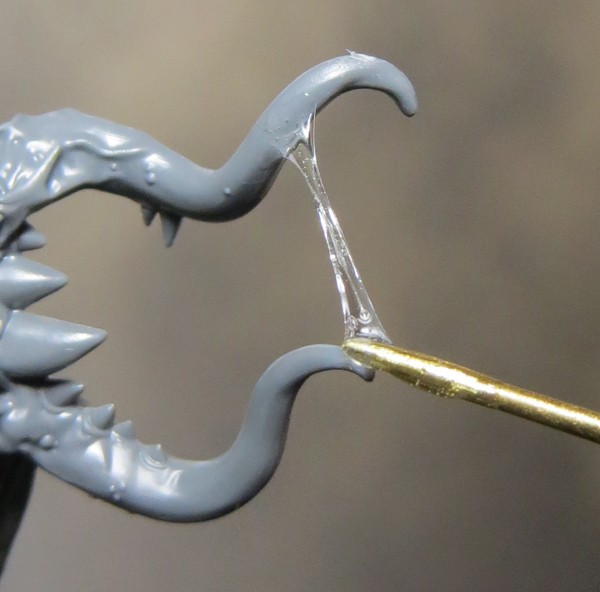 It allows me to create very small drips and doesn’t show through the clear slime medium. 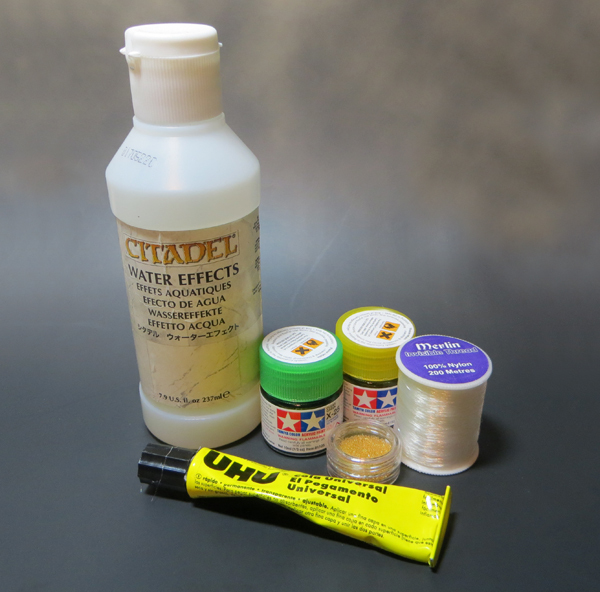 The addition of clear microbeads gives a grotesque bubbly texture that looks especially good on Nurgle minis. The first stage was to use the UHU glue to create some clear stringy threads between the tentacles. These serve as a support for the tinted water effects. This is a tricky process at best. It involves attaching a small blob of UHU to one tentacle and then stretching it across to another and fixing it there. Squeeze out a small amount of the glue onto a palette and wait a minute for it to become less fluid and more stringy. Use something like a toothpick to apply a small amount of glue to the mini. 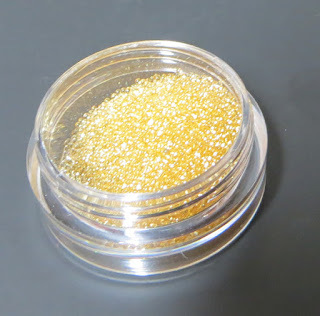 I’d advise some experimentation with this material before using it on a painted mini! You can remove the glue before it fully sets but it’s not an easy thing to do and there is a strong risk of damaging the paintwork. Once I was happy with the stringy threads I left the UHU to dry completely overnight. The next step is to build up the green slime over the stringy threads and tentacles. Water effects will shrink as it dries out so it’s important to allow each coat to dry before you apply the next. If you build up too thick a layer the shrinkage may cause it to distort. It’s also during this stage of the process that I build up the drips. Once the slime is done you can add the microbeads. First mix a few of the microbeads into a drop of the slime mix. Then put a small amount of the slime onto the mini where you want to fix the beads. This will make it easier to push the microbeads around a little to get them into position. 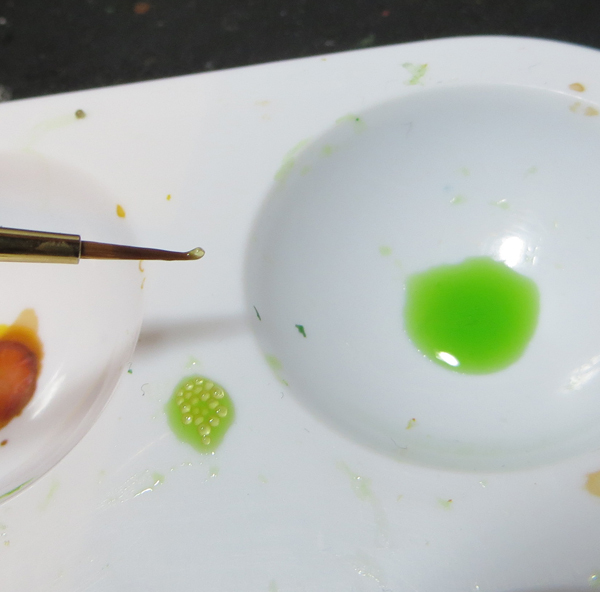 Pick the microbeads off your palette with a clean paintbrush and position then on the mini. You can do this with a few at a time or one by one for more control.